(Wash. DC) There’s one major obstacle blocking a theft of the 2008 presidential election. It’s highly significant and challenges even the most devious minds. That obstacle is the “net new” Democratic primary voters” in 2008. 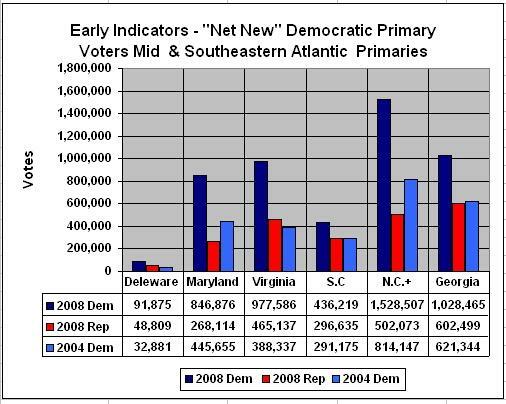 “Net new” Democratic primary voters represent the difference between primary turnout in 2004 and 2008. More on that in a moment. If you think that 2000 and 2004 were free and fair elections and that the idea of election fraud is specious, that’s fine. You might want to review some of the following. Al Gore won the 2000 election by over 500,000 votes. He did not become the president and was denied a recount by the court that made Bush the president. Stolen election. Case closed. 2004 was not a “red versus blue” election and the winner is still in the U.S. Senate. The red segment of the total vote (the rural U.S.) was down from 23% of the vote in 2000 to 16% in 2004, with two million less Bush votes, in actual terms, in 2004. Bush “won” 2004 through a fictitious increase in “big city” voting (“big cities” are defined in the exit polls as those with greater than 500,000 population). The same people who stole those two elections just took $840 billion of your money and are giving it to their Wall Street donors. They’re the same people who started a war with Iraq based on documented lies and who continued it for five years, with a combined death toll of over one million Iraqi civilians and thousands of U.S. soldiers. They are the people who won’t correct the lie and insist on more of the same. These people resolutely ignore the looming climate changes to the planet that forecast death to tens of millions and the likelihood of multiple scenes like those after Hurricane Katrina. Here’s the problem for the election thieves. Their strategies all rely on keeping people from registering, keeping those registered away from the polls, and the magic of electronic voting and tabulation. It won’t work this time. But first, here’s a quick look at the strategies in place. The most effective and enduring is the disenfranchisement of ex-felons, citizens who have served their time and are no longer charged with anything. Florida, Texas and Virginia account for nearly 1.5 million citizens, largely poor and black who were denied the right to vote. They paid their debt to society but they can’t participate as citizens because their vote is stolen by the remnants of a racist inspired post reconstruction movement in both the former Confederate states and cooperating state legislatures across the country. Voter suppression also includes tactics like false notices announcing changes of election dates; police cruisers at intersections near voting places; threats that voter will be challenged; poorly trained poll workers who send registered voters away; special identification requirements proven to reduce the vote (e.g., photo identification); and much, much more. The newest rage is “cleansing” centralized registration database. The Florida pre 2000 voter registration purge of tens of thousands of minority voters cost Al Gore the election and inspired federal policies supporting registration cleansing around the country. Then there are the seemingly endless examples of electronic voting machines improperly recording and counting votes plus security problems. There are no real methods of checking electronic voting. Even if you could and proved fraud, state recount laws are very difficult to invoke and highly restrictive. In Virginia and Florida, for example, it is illegal to recount the paper forms for optical scan voting machines as part of a recount. What a total mess and a complete mockery of the democracy that we deserve. But when you add up all of these strategies, based on past performance, they work at the margins – maybe a 3-4% shift in votes to the Republican candidate. There will still be election fraud at multiple levels in 2008. It’s a national tradition dating back to the Whig Party chasing off immigrant voters in the early 1800’s. But in terms of outcome, this election can be an accurate reflection of the wishes of a majority of voters even with the typical switched votes and varieties of voter suppression. The solution to election fraud and the best policy for election protection is voter increases accounted for by those “net new” Democratic primary voters. The voter turnout in the presidential primaries was extraordinary in many states. In some cases, like Virginia, the total voters in 2008 more than doubled the total from 2004. The surge of voter turnout in the primaries began in the mid Atlantic states and carried on through the southeastern seaboard. In addition, swing states showed the same extraordinary trend, a trend that helped Obama win with “net new” primary voters. At the same time, turnout in the contested Republican primaries was paltry by comparison. Clearly, Republicans were not motivated. For example, look at the mid and southeastern Atlantic results, the states that gave Sen. Obama a clean sweep. In the mid and southeastern Atlantic states, there were nearly 4.9 million Democrats voting in primaries compared to 2.2 million Republicans. With the exception of Delaware and Maryland, the states above are traditionally Republican states. Democrats dwarfed Republicans in 2008 primary turnout. In addition, Democratic turnout nearly doubled from 2004 to 2008. Democratic primary votes increased from 2.6 million in 2004 to 4.9 million in 2008 (using the estimate for N.C. 2004), an increase of 2.3 million “net new” Democratic primary voters. Let’s look at the critical swing states. A similar, somewhat less dramatic pattern emerges. The one exception to the pattern is Florida. The Republican state legislature moved the Florida primary back to late January. 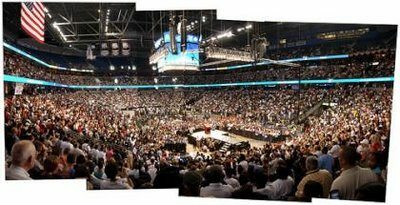 The Democratic National Committee warned that the election could not be used to select delegates to the national convention. This substantially suppressed turnout by Democrats. While Florida Democrats doubled their 2004 turnout, they were nearly equaled by Florida Republicans who faced the same restrictions on the early primary. These four critical swing states all went Republican in the last two presidential elections. But they show a pattern similar to the trend begun in the mid and southeastern Atlantic states. These primaries saw 5.8 million Democratic primary voters compared to 3.9 million Republicans. The Democrats more than doubled their 2004 primary voter total, 2.7 million voters, to 5.8 million in 2008. That’s a 3.1 million increase in Democratic primary voters. These figures are in line with the mid and southeastern Atlantic states. The critical factor is that these “net new” Democratic primary voters were not turned away from the polls by the traditional election fraud strategies. They’re on record as voting in the most recent election, and they’re highly likely to turnout for the general election, without any real impediments to vote. It’s axiomatic that primary voters do just that. One more factor to consider is voter registration in these states. There were major voter registration drives in the southeastern Atlantic states. The least likely Obama state, South Carolina, has seen 240,000 newly registered voters. That figure could approach 300,000. North Carolina has 600,000 new registered voters with 48% Democrats, 21% Republicans, and 31% Independents. There’s a strong tilt toward black voters and the 18-24 age group. Georgia voter registration drives have been intense as well. A pattern similar to North Carolina is emerging in Georgia with one county, Bibb, reporting a 20% increase in black voter registration compared to 1% for whites. Of Georgia’s 400,000 newly registered, there’s an almost even split between black and white registrants. Adding Maryland and Delaware, these states have about 1.7 million newly registered voters. They also have 3.1 million “net new” 2008 Democratic primary voters. Virginia is now a key swing state. Northern Virginia and the state’s major cities statewide are solidly Democratic. Overall, Virginia has 300,000 newly registered voters with 42% under 24 years of age. Ohio has over 660,000 newly registered voters, with 19% living in counties that Kerry won (140,000) and 1% in Bush counties (5,000). There are almost 800,000 new voters in Florida and Democrats predominate, trailed by Republicans, and Independents. The youth vote of registered voters has increased from 4% in 2000 to 14% in 2008. Missouri will have over 200,000 newly registered voters. Combined, these swing states have about 2.0 million newly registered voters and 3.1million “net new” 2008 Democratic primary voters. These registration trends, particularly in the critical swing states, offer some hope regarding election fraud. Somewhere around 65% of newly registered voters actually turn out to vote. But they’re not enough to solidify a majority victory in the reported vote count for the majority voting. Voter registration in the swing states and throughout the country are up significantly and they favor Sen. Obama’s candidacy. But there were also significant increases in voter participation and new registrations from 2000 to 2004 with an emphasis on the youth and minority voters. This is very good news since it shows an expansion of citizens exercising their fundamental rights. The 2008 shifts in demographics in the newly registered will benefit Obama’s campaign. However, this is an existing trend, not a new wave of voters who can be assured of voting; voters who will face few if any impediments getting into the voting booth. It is those extraordinary increases in primary voting that represent the new element in the election process. These voters were not seen in the 2004 primary. They were on the rolls for the 2008 primary and, without question, eligible for the 2008 general election. Who are they? We don’t know for sure but the simple answer is, they’re citizens who were motivated enough to vote in this primary cycle, elections frequently ignored by large numbers of voters. 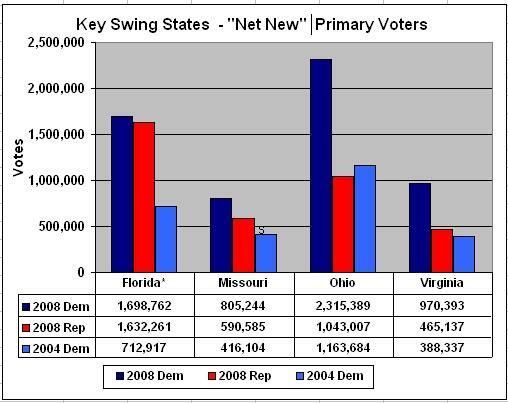 The swing states had 3.1 million net new primary voters in 2008 and an aggregate 2.0 million increase in newly registered voters. There may be some overlap but the primaries took place at the start of the year in these states and the registration drives for the general election took off after the primaries. So they should be viewed as largely discrete figures. These net new primary voters create problems for election thieves. If we assume a 20% turnout increase in the four swing states considered, that comes to a total of 23 million voters. The 3.1 million net new primary voters represent 14% of that total. They can all vote. They’re all registered and they all voted in the most recent election. They can’t be turned away easily. They will be unlikely to become confused or intimidated by the traditional voter suppression tricks. The only fraud strategies available are through electronic voting machines and outright changes in vote totals. Thus, with fewer tools (disenfranchisement and suppression are out for this group); election fraud would need to wipe out 14% of the estimated vote. That’s to obvious and that’s why the “net new” voters from the Democratic primaries in these four key swing states, the mid and southeastern Atlantic states, and any other state fitting this 2008 primary voting pattern represent the best assurance against election fraud available. Pay close attention to the Republican “spin machine”, they have already begun discussing how the democrats stole, or will steal, the election. They have very difficult time believing that they could actually lose an election, if they do. Regardless of how it looks now for Obama, it would be foolhardy to count them out. I’m sure they have some tricks up their sleeve yet to be played.